Check out our art gallery, a revolving door of local artists, some of whom you may already know, selling their art prints and original work! We are currently featuring art on the south wall of the store from local artists, Glenn Barr, Scott Jones and Andrew Buck. 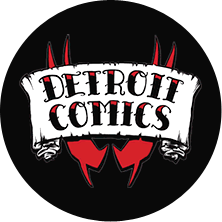 If you are interested in having Detroit Comics display your art for sale, please contact Brian Kelly at detroitcomics@hotmail.com.